Song, a businessman from Chengdu, Southwest China's Sichuan Province, visited Lake Baikal in Russia's southern Siberia in January of 2016 at the invitation of a friend. Once there, he not only was impressed by the magnificent landscape but also by the growing number of Chinese tourists arriving there to spend their winter holiday. He immediately saw a business opportunity. With an initial investment of 80 million yuan ($12.3 million), Song soon acquired some land at Lake Baikal, where he is presently building four mid-range to upscale lakeside hotels. 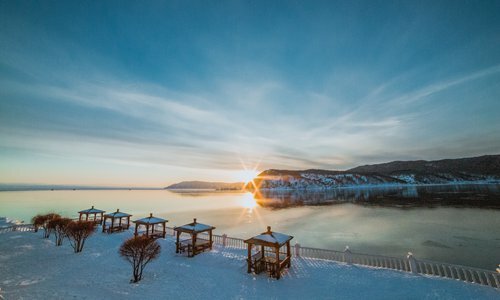 With a total of 220 rooms and suites in three locations on the lake's island of Olkhon, in the village of Listvyanka and near Baikal Pier, Song's first hotel is scheduled to open this March. "The market is very promising," Song told the Global Times. "Existing local hotels are sub-standard, and the supply simply can't meet the rising demand." Song is one of a growing number of Chinese investors who are eyeing the south Siberian tourism industry. But the sudden influx of Chinese tourists and investors, ubiquitous Chinese-language land sale advertisements and an ever-rising number of construction sites are also causing panic among local residents as well as Russian nationalists. Over 57,000 Russians recently signed an online petition to ban all Chinese from land purchases at Lake Baikal. The petition was addressed to Russian politicians including President Vladimir Putin. "Already, 10 percent of village land in Listvyanka belongs to the Chinese. If this goes on, then in five to 10 years our old Russian village will inevitably turn into one of the Chinese provinces," reads the sensationally worded petition, written in Russian by a netizen named Julia Ivanets. It also complains that many Chinese tour guides tell visitors that Lake Baikal used to be Chinese territory and that now China hopes to re-conquer the area by buying it back. "We MUST at least think about the future, if we do not want to be conquered!" it concluded, gaining coverage in Russian media, including Moskovsky Komsomolets, a tabloid. Another article in Moskovsky Komsomolets quoted residents in Listvyanka as saying the Chinese have bought up all the best properties there, especially those facing the lake. Some residents also claimed that Chinese investors fail to respect the local environment by pumping their sewage directly into Lake Baikal. The number of Chinese tourists arriving at Lake Baikal every winter has risen in recent years after a folk love song by singer-songwriter Li Jian, "Baikal Lakeside," became a hit in China back in 2015. On music app Netease Music, the song, whose lyrics describe the lake as "crystal clear and mysterious," has been listened to millions of times, along with over 40,000 comments from listeners. Unlike traditional Russian tourism destinations such as Moscow and Saint Petersburg, which attract Chinese tourists with their cultural heritage, revolutionary history and mature tourism infrastructure, Lake Baikal is among the "off the beaten path" options for middle-class Chinese tourists seeking "an adventure." Only a three-hour flight from Beijing, the region is also more convenient to travel to than Moscow. Last year, over 20 Chinese cities launched direct flights to Irkutsk, the base city for visiting Lake Baikal. Russia also eased its visa requirements for Chinese who are in a tour group of at least three persons, as part of the Belt and Road initiative to boost tourism between the two countries. According to statistics, 43,600 Chinese tourists visited Irkutsk in 2016, up 150 percent from the year before. In the first half of 2017, Irkutsk received 23,500 Chinese tourists. "If you come to Irkutsk, you'll see that over 80 percent of all tourists are Chinese," Song told the Global Times. But Chinese investment isn't as heavy as the Russian petition claimed. "10 percent is an exaggeration," Mr Li, a Chinese businessman who has been living in Irkutsk for many years, told the Global Times. Li explained that, while there are five or six Chinese hotels on the island of Olkhon or in Listvyanka in total, and even though some Chinese have purchased homes there to rent out as bed-and-breakfast inns, they occupy less than 10 percent of the lakeside area. Viktor Sin'kov, head of the legal department in Listvyanka's municipal government, confirmed in a recent Financial Times article that the actual percentage is much less than 10 percent. Both Li and Song admit that many Chinese hotels at Olkhon and Listvyanka have no license, but said this is a universal phenomenon in the region not exclusive to the Chinese. Song explained that it is very difficult to obtain licenses in Russia, as newly-built hotels must go through a series of steps such as environmental checks. "The entire process might take up to three years, far too slow for Chinese investors," he said. According to local statistics, among the 100 tourism facilities in Listvyanka, only 15 have official licenses. The claim that Chinese investors are violating the environment is also unfounded, according to Lin Xiujuan, a local representative of a Chinese organization based in Irkutsk. "The local government has no statistics on how many hotel owners are Chinese, nor any concrete examples of Chinese harming the local environment. These are all just rumors," she said. "Also, a lot of investors who seem to be Chinese nationals have actually gained Russian citizenship. So legally speaking, they are Russians." Chen Bin, a Chinese tour guide based in Listvyanka, said it is common for Chinese guides to explain to Chinese tourists that Lake Baikal used to be Chinese territory, as that is an historical fact. "The area belonged to China until China and Russia signed the Treaty of Nerchinsk in the Qing Dynasty (1644-1911). This is just background information. We have no intention of telling Chinese tourists to conquer the area back. That would be ridiculous," he told the Global Times. One major reason why Chinese investors are suddenly being panned by Russian netizens and nationalist activists seems to be that Russians do not feel they are financially benefiting enough from the Chinese tourism boom. Alexei Tsydenov, acting head of the Republic of Buryatia where Lake Baikal is located, said during a recent meeting with President Putin that the potential for tourism development was one of "many advantages" enjoyed by Buryatia, which lies on the shore of Lake Baikal, Siberian Times reported. But he also said at a forum last April that he would not like it if Chinese only build their own hotels and bring Chinese tourists there in their own airplanes. Song agreed, saying he is more than willing to employ Russians at his hotels, not just because they are locals but because Russians are cheaper to hire than Chinese due to the weakened Russian ruble (currency) and increasing labor cost in China. "We spoke to the governor and agreed to employ more locals in our future hotels," Song told the Global Times. 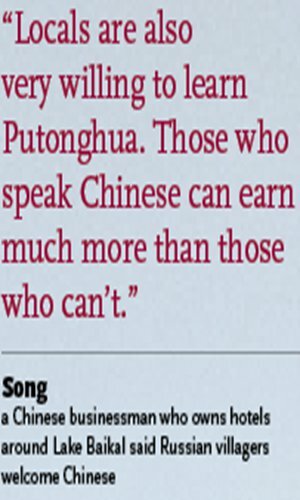 "Locals are also very willing to learn Putonghua. Those who speak Chinese can earn much more than those who can't," he added, believing that the majority of the 57,000 people who signed the petition are not from the two towns by Lake Baikal, whose total population is only 7,000. The unique cultural status of Lake Baikal among Russians is another reason why Russians are so sensitive about anything that might threaten their "sacred sea." Last year, 300,000 people signed two online petitions to scrap construction of a bottled water plant being built in Irkutsk by a Chinese company. A proposal by the Chinese city of Lanzhou, Gansu Province, to divert Siberian lake water to China's arid northwest last year was also met with vocal opposition. Despite such online opposition, Russia's local government continues to call for even more Chinese investment. 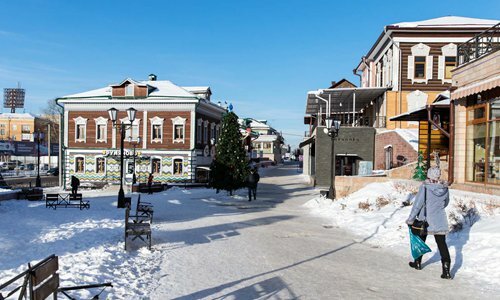 Irkutsk governor Sergey Levchenko said that as Chinese investors are showing increased interest in tourism projects around Baikal, the town is building a "special economic zone," which will be completed by 2055, according to Russian news agency Ria Novosti.